I have been looking for a small rectangular kitchen table ever since I found this fabulous one in Coastal Living. I have a small nook that needs a small table and I love mixing textures as they did here. Metal base, wood top and rattan chairs. Well if you continue to look online for ideas you continue to love everything you see. Built-in seating. 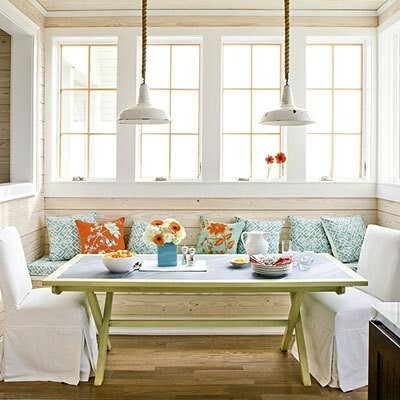 What a great idea if you have the room........if not, how about a small bench? Than I found this table that I absolutely fell in love with, but have yet to find similiar. Looks like a picnic table but painted. I love the crossed-legs. Where can I find this table? If you have a lead...let me know!